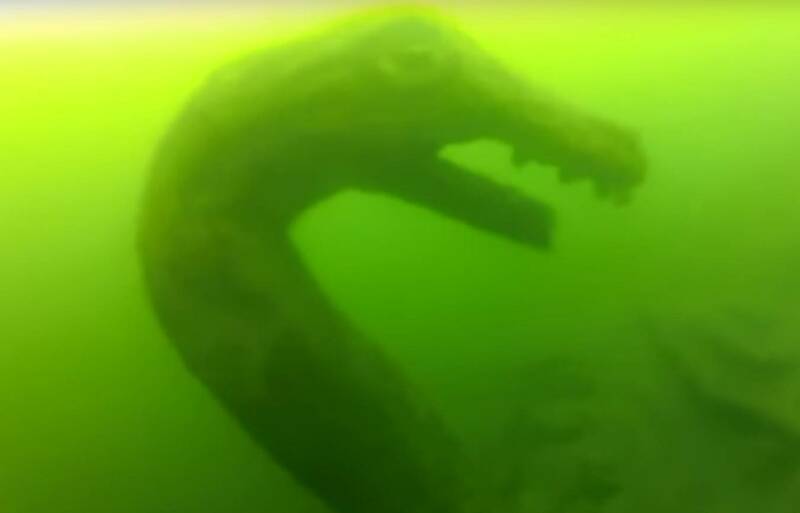 An eight-foot tall, 14-foot long sea monster resides at the bottom of Okanagan lake. It’s a life-size homage to the legendary N’ha-a-itk, better known to many as Ogopogo. A statue of the legend resides 30 feet beneath the surface at Paul’s Tomb, to the left of the bay in Knox Mountain Park. Doug Lundgren, office manager at Diving Dynamics, helped install the statue in the early 1990s with a team and the artist, who he says lived in the Pandosy neighbourhood. “The statue is fantastic, we take scuba divers down there and the visibility is about 10 or 12 feet, they are looking down and all the sudden they see this green shadow and their eyes just become dinner plates,” said Lundgren. The Westbank First Nation describes N’ha-a-itk as a fierce lake monster that resided at Squally Point. The name wasn’t changed to Ogopogo until a British dance hall song, written in 1924 was composed. It is believed that the legendary N’ha-a-itk has a snake-like body of about 25 metres long, some say it looks like a horse, others say it looks like it’s reptilian or goat-like. The artist’s rendition of Ogopogo resembles the snake-like description. The statue has been featured in Diving B.C. Lakes and Rivers by diver William M. Hall, who says it’s not the only treasure to be found in the depths of Okanagan Lake. The statue of Ogopogo is nestled near a sunken power boat. Across the lake, at Wilson Landing, there is a submerged milk truck from what he estimates the 1950s. There is also a Canadian Pacific Railway barge 300 feet deep at Bear Creek Provincial Park, several underwater parks for divers, and for the experienced, they can follow the old ferry line across the lake and discover hidden treasures from years before. “There are some neat things to see. My favourite thing in the Interior, not just the Okanagan but in the Kootenays as well, is the fact that back in the 1800s before there were roads and there were mining camps and a railhead north in Revelstoke and one in the south in the U.S. the only way to get up and down were the ribbon lakes or by donkey. As a result of that, throughout the lakes there are a lot of remnants of these barges they used from mining towns, small strips of railway, used barges and steamboats,” said Hall. “You can find old sternwheelers, battle wheelers, steamboats, tugboats, barges they used to carry rail cars that fell off. In each old mining town, the water used to be the dumps and you can find artifacts that people threw away, that’s the part (of diving) that I like,” said Hall.